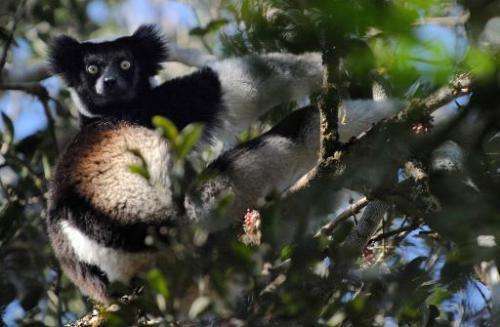 Immortalised in the hit cartoon "Madagascar", real-life lemurs face extinction within 20 years short of drastic action to tackle the poverty driving islanders to poach the primates and destroy their habitat. Each year that passes hastens the decline of the saucer-eyed primates, as the Indian Ocean island's people struggle for survival amid a drawn-out political crisis. "As long as there is poverty, we can't expect to prevent the lemurs' extinction," said primatologist Jonah Ratsimbazafy from the University of Antananarivo. Cast as a lovable bunch in the "Madagascar" movies, lemurs occur in the wild only on the island, having evolved separately from their cousins the African ape over millions of years. Madagascar is home to 105 different species of lemur, accounting for 20 percent of the world's species of primate, in an area spanning less than one percent of the global habitat of all primates. But crop burnings and wild fires destroy 200,000 hectares of Madagascar's forest a year. And the 13 percent of its natural forest that remains may disappear within a generation, according to Ratsimbazafy. "If this rate of deforestation continues you could say that within 20 to 25 years there won't be any forest left, so no lemurs either," he said. 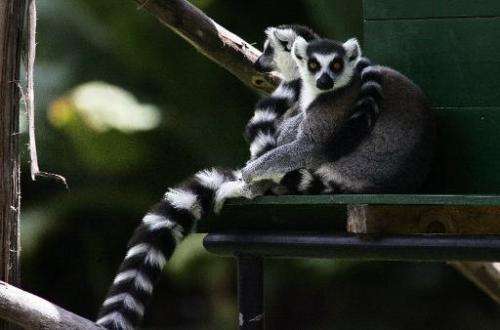 Ninety-three of the 105 known lemur species are on the endangered list. An estimated 92 percent of Madagascar's people live on less than a $2 a day, and social conditions have worsened on the island since its leader Andry Rajoelina seized power in 2009 with the help of the army. Most foreign aid was suspended, bringing the economy to its knees and putting the country at risk of a food crisis—a situation exacerbated by a locust plague this year. The broke state has scheduled a presidential election for later this month aimed at ending the four-year political crisis. The island's blossoming tourist industry also suffered a blow this month following the mob lynching of two Europeans and a local man accused of killing a boy on the Madagascan tourist island of Nosy Be. The deadly riots sparked travel warnings from several countries including France and the United States. 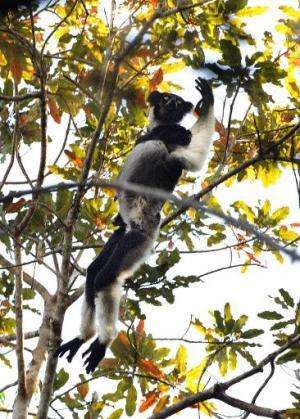 Meanwhile locals eke out a living where they can—including by looting precious woods, minerals and lemurs from the forest around them. Small-scale woodcutters also hunt the animals for food while searching for rosewood, according to Tovonanahary Rasolofoharivelo, another primate expert. "Often they don't bring enough to eat and woodcutting is hard work, so they eat lemur meat because the animals are easier to catch than birds." Gold-diggers are pushing into the forest too, chipping away at the lemur's habitat. Rangers have to travel far, often camping on the way, to track the diggers, said a guide from the Ranomafana National Park in the southeast of the island. "There are many gold prospectors in the park. You can earn up to 100,000 ariary ($46, 35 euros) per gramme of gold," said the guide, who asked not to be named. And all the while, crop fields are steadily encroaching on the forest, a little more each year. "In tropical countries like Madagascar the soil is very, very poor," explained Ratsimbazafy. "One year a farmer plants here, next year he moves, again, and again, and afterwards you have deforestation, the desert." A coalition of conservationist groups have launched an international campaign to raise around $8 million, in a do-or-die effort to reverse the trend. The three-year programme aims to help provide alternative livelihoods for the local population, in addition to tourism and agricultural programmes that have been running for a few years. "We try to finance money-generating activities like planting beans, and pig, chicken or fish farming, so that people in the countryside stop destroying the forest," said Benjamin Andriamihaja, local representative of the US-based Institute for the Conservation of Tropical Environments (ICTE). "But it's difficult to compensate for the lack of revenue of locals who don't think long-term," he added. An international conference was held in August to discuss conservation strategies near the Ranomafana park. These days, at the entrance of the 40,000-hectare reserve, tour guides and self-styled trackers sit waiting for tourists to arrive. But their numbers have dwindled compared to a year ago, with small-scale smuggling simply a more lucrative option for many. Watermelon (green on the outside, Red on the inside) isn't a good social or political strategy. Allow free people to remain free. Do not presume to know better how to run their lives than they do. Gad, you people are contemptible, lemurs notwithstanding.